Dr. Hakim Md. Yousuf Harun Bhuiyan, Managing Director and Chief Mutawalli of Hamdard Laboratories (Waqf) Bangladesh and founder of Hamdard University Bangladesh. He is the architect and innovator of modern Hamdard in Bangladesh, made a breakthrough in the history of Eastern/Unani medical science in Bangladesh. He has succeeded to get the official recognition of unani medicine in Bangladesh. His utmost effort made it possible to reintroduced unani medicine as the bridge between traditional medicine and modern medicine. The development of Unani medicine during the entire 20th century owes its vitality to the three towering figures in the persons of Hakim Abdul Hameed from India, Shaheed Hakim Mohammed Said from Pakistan and Dr. Hakim Md. Yousuf Harun Bhuiyan from Bangladesh. He was born in 1st March 1953 in a modest family in the district Luxmipur, Bangladesh. 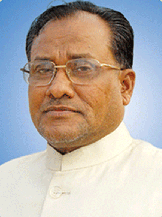 He joined Hamdard in 1972 and took over the challenge and responsibility of Hamdard Bangladesh in 1982. He started its journey with only Tk 50,225/- as balance while Tk 2,92,000/- was in debt with 23 officers and workers. Today’s Hamdard Bangladesh and Dr. Hakim Md. Yousuf Harun Bhuiyan are the burning example that, without having any financial support, one could make a tremendous change only by dint of strong mental determination, keen and sharp brilliancy, hard effort and deep hearted hard work. To maintain the highest standards of herbal medicine Dr. Hakim Md. Yousuf Harun Bhuiyan has setup State of the art Factory, in Sonargong, Narayangonj, with modern scientific equipments, run by qualified experts. He has established Quality Management System to check every step of production & marketing, right from the procurement of raw materials, inprocess quality control, finished goods quality assurance & post delivery customer service. To ensure health service all over the country, especially for the mass people he has established medical centers all around country. At Hamdard medical centers no fees are charged to anyone for consultation. The patient only pays for medicine. Indigent patients are given all treatment and medicine free. His long cherished dream of building Hamdard Biggan Nagar (City of Science, Education & Culture)- His dream now became existence. Already Hamdard University Bangladesh has established and started its activities with the faculties of Science & Engineering, Arts & Social Science, Business Administration and Natural Medicine. Hamdard Public College has became well known College in Bangladesh for it’s excellent academic result. Hakim Said Eastern Medical College & Hospital, Dhaka, Hamdard Unani Medical College & Hospital, Bogra, Rowshan Jahan Eastern Medical College & Hospital, Lakshmipur are also well reputed Medical College in Bangladesh for giving quality education to unani science students. The following projects will be established soon- Hamdard Medical College & Hospital, Hamdard Public School, Research Center, Scholars' House, Central Library, International Conference Center, Children Park, Sports Complex, Horticulture Center, Botanical Garden at Gazaria, Munshigonj. By the Grace of Allah, the dream is taking a concrete shape. Relentlessly he elapsed a number of sleepless nights for sake of people’s welfare. He continuous the motto & vision of Hamdard because his belief in heart that target could be achieved by hard work, perseverance, labor and practice. He has proved it by himself. He turned the Hamdard as the prominent industry from zero status by virtue of his endeavor. ⦁ Founder, Hamdard University Bangladesh. ⦁ President, Mutually Samity, Bangladesh. ⦁ Member, National Organizing Committee, ASOMPS (Tenth Asian Symposium on Medicinal Plants, Spices and other natural products) held in Dhaka, Bangladesh on 18th-23rd November, 2000. ⦁ Dhaka Social and Cultural Organization Gold Medal (1995) as Unani Medicine Specialist etc. For the development and globalization of Unani Medicine he has been arrange and attend many Seminar and Workshop in the following Countries- India, Pakistan, China, USA, England, Australia, Singapore, Thailand, Malaysia, Myanmar, Saudi Arabia, Iraq, Jordan & Turkey etc.